For the tabbouleh, cook the quinoa in boiling water for 15 minutes, drain and cool under cold water. Mix in the lemon juice, tomato and parsley. Season with black pepper. Meanwhile, place the cod on a lightly greased baking tray. Mix together the rapeseed oil and lemon zest, season with black pepper and drizzle over the cod. Bake for 15-20 minutes until just cooked through. 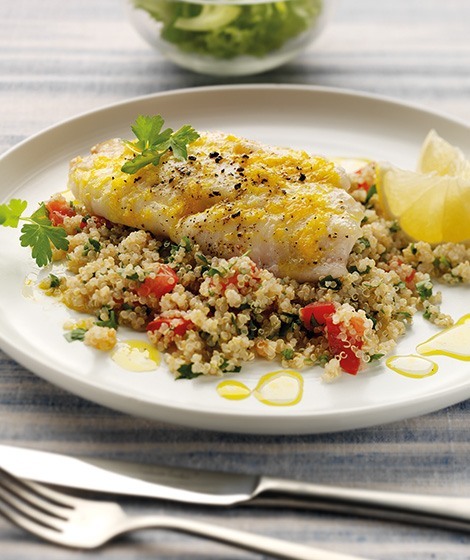 Serve the cod on a bed of the quinoa tabbouleh. Try swapping the quinoa with bulgur wheat or couscous.